ZGametools Baker is at an early stage of the development, this article is outdated. The Module is dedicated to model baking and suggest two workflow, baking using the Zbrush Algorithm or Using Subtance batchtools if you own a licence of substance designer. The toolset work with OBJ file only. 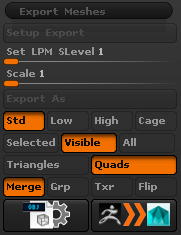 Export in accordance to Selected, Visible or All Substools from the Ztool. Utilize Core module to Open and Edit, the Current Subtools with the defined 3d Editor you had setup. Generate a melscript, in case you want to open all the Obj files exported within the workspace DireCtory. Utilize the Core module to open rendered map in your Image Editor. 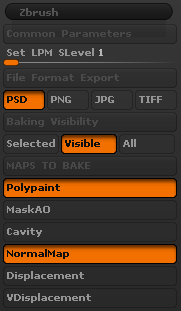 Export format file : PSD , PNG, JPG or TIFF, TGA and DDS.